Today is Friday the 13th—fear of this date, known as friggatriskaidekaphobia, is named after Frigg, the Norse goddess whose name inspired the word “Friday.” Norse mythology has it that 12 gods were having a lovely banquet at Valhalla when Loki, the god of mischief who was not invited, showed up, bringing the number of diners to 13. You know what happens when an uninvited guest comes over and crashes the banquet? Total chaos and the death of a “good god” named Balder and many, many tears. With that said: Please do not be the Loki of your parties. Instead, why not bring a refreshing, nourishing dessert to make sure that your presence is welcome? As this legend stems from Norse mythology, we’ll be making an old Swedish fruit soup, known as fruktsoppa, a long-popular dessert in various Scandinavian and Eastern European cuisines. What? You don’t like the idea of cold fruit soup? Too bad. As the old Norse proverb goes, “Generous and brave men live the best.” To get us into the mood, I’ll be referring to Norse proverbs throughout this recipe—they all come from Hávamál, which is like an ancient version of Seven Habits for Highly Effective Vikings. 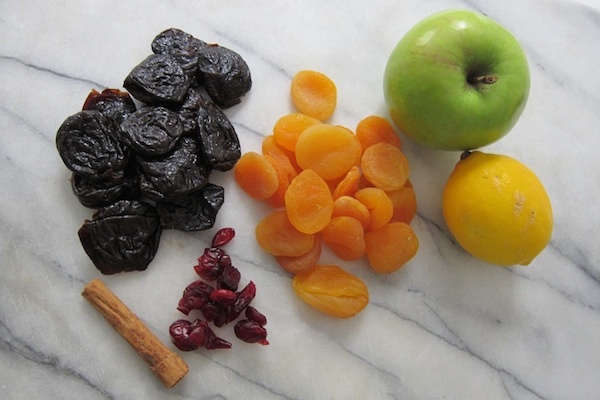 Soak apricots and prunes in 6 cups of cold water (gather from a local sjö, or lake). As they soak, ponder thisominous Norse proverb: Two heads cut off and thrown high into the tree have only the winds with which to scheme. Indeed. Add cinnamon stick, lemon slices, tapioca, and sugar and bring to a boil. Reduce the heat and simmer, covered, for 15 to 20 minutes, stirring occasionally to prevent sticking. Add the raisins, currants, and apple slices and simmer an additional 5 minutes, or more, until the apples are tender but have not disintegrated. Pour the mixture into a bowl and cool to room temperature. Remove the cinnamon stick and serve at room temperature or place in refrigerator for later serving. Keep in mind: The wolf and the dog do not play together (Hávamál). Fact. Add a dash of your choice of wine, rum or Cointreau. How hard was your day? Increase amounts accordingly. Put it in a fancy bowl from IKEA and serve. VERDICT: A goopy sweet dessert soup with swollen prunes and soft chunks of rehydrated fruit. Syrupy texture, very sweet taste and not totally unpleasant. Good for those who like to eat smoothies with a spoon and/or the toothless octogenarian in your life. Add herring on the side to truly embrace Scandinavian cuisine and bring to your next Smörgåsbord. As it is loaded with sugar, which inhibits microbial growth, you can enjoy this for awhile—yum! Now: Go forth. Do not fear Friday the 13th. Choose to embrace fruit soup instead, and to live by another timeless Norse proverb: Thou should never sleep in the arms of a sorceress, lest she lock thy limbs (Hávamál, st. 113). Jessica Pan and her friend Rachel Kapelke-Dale wrote an epistolary memoir about living in Beijing, New York, Paris and Melbourne. Graduates in Wonderland is out now.